Is ‘doing what you love’ part of the worker engagement problem? When discussing career advice, we’re often told some variation of the adage, “Do what you love, and you’ll never work a day in your life.” That certainly seems like sensible advice, but when you consider that nearly 70% of U.S. workers are not “engaged” at work, it becomes clear that we’ve either ignored the wisdom of the sentiment, or that the advice wasn’t sound to begin with. 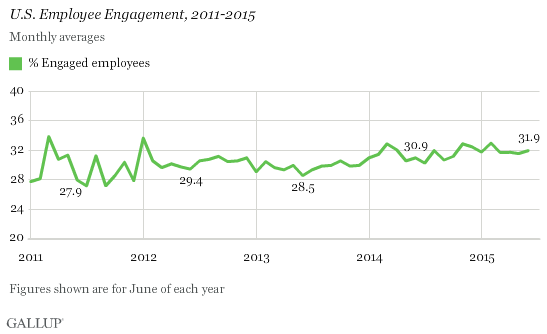 Gallup, in its June survey of U.S. worker engagement, reported that for the first six months of 2015, engagement figures have steadily hovered steadily between 31.5% and 31.9%. What’s almost more sobering is that only 40.4% of managers reported feeling engaged in their jobs. Read more of my analysis on the report – and why a focus on passion might be the undercurrent creating this engagement issue – via LinkedIn.